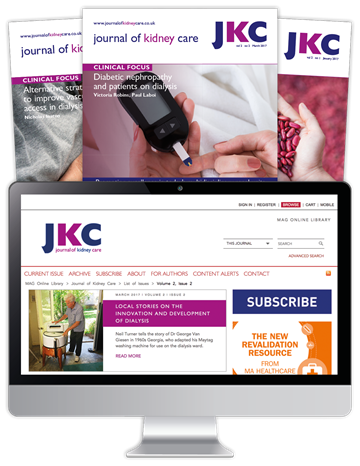 Journal of Kidney Care (JKC) is the peer-reviewed publication dedicated to the UK's multidisciplinary renal specialists, and the official partner journal of the British Renal Society and the Association of Nephrology Nurses UK. 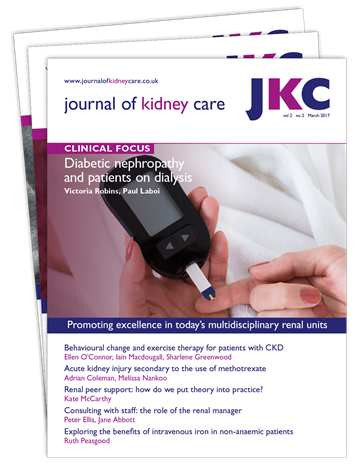 It publishes the most recent and relevant clinical reviews, research findings and medical education, to help advance the evidence base for renal medicine, and provide the basis for our readers' continuing professional development. Subscribers also receive unlimited access to CPD Launchpad - the online platform helping nurses to revalidate. 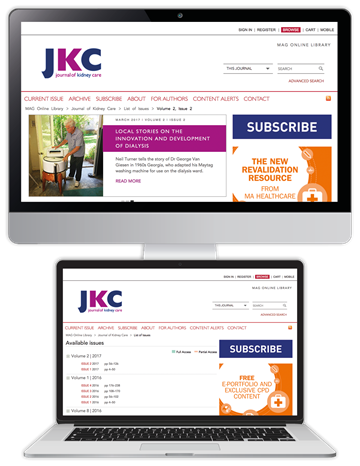 All delegates at UK Kidney Week 2018 are eligible for a 25% discount on their subscription to Journal of Kidney Care. Order with code BRS25 to claim your special offer - and subscribe from only £21.00 £15.75.